I have long held that masking is an essential component to a good skincare routine, and I have been obsessed with high quality masks as long as I can remember. My penchant for clay masks dates back to my early teenage years, and has never abated. In fact, given the technological advances in skincare, I would contend that my love of masks has exponentially increased over the years! My latest mask obsession is StriVectin Instant Revitalizing Mask, and to state that I am obsessed with it is an understatement. Don't let the inclusion of Bentonite near the top of the list of ingredients lead you to believe that this is some sort of ordinary, and skin drying, clay mask– it is nothing of the sort. Whether you have dry, combination, normal, sensitive, finicky or acne-prone skin you will see the many benefits from this miracle mask. StriVectin Instant Revitalizing Mask is a brightening and revitalizing mask that gently, effectively and decisively exfoliates dead skin cells revealing a glowing complexion with pronounced clarity and radiance. Instantly brightens and revitalizes skin for a more youthful glow. Instant Revitalizing Mask is an intensely nourishing 15-minute facial mask that restores clarity and immediately illuminates the complexion. An effective dual-action complex of skin brighteners and Alpha Hydroxy Acids (AHAs) helps unify uneven skin tone and promote a smoother, younger looking complexion. Unlike many clay-based masks, that tend to leave skin taut and dry, this one does not. Simply apply a thin layer of the white mask over the whole face, avoiding the delicate eye area, and leave it on for fifteen minutes. When it dries down, skin doesn't feel tight, dry or uncomfortable in the least bit. Removal is easy and immediate, and does not require extensive rinsing or scrubbing to remove. An intensely nourishing and revitalizing 15-minute facial mask to restore clarity and immediately illuminate the complexion. An effective dual-action complex of skin brighteners and Alpha Hydroxy Acids (AHAs) helps unify uneven skin tone and promote a smoother, younger looking complexion. 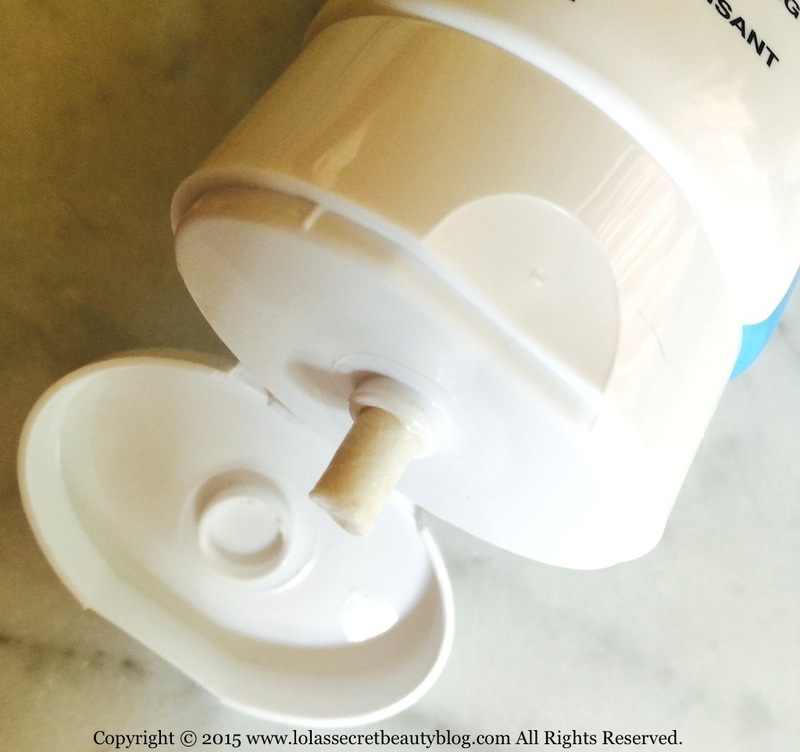 Renews clarity and immediately brightens the complexion. As skin texture becomes smoother and more refined, the complexion appears revitalized and awakened with a healthier, more youthful glow. Whenever I remove the mask, and carefully study the condition of my skin, I immediately note that my complexion is bright, glowing, smooth, supple, even in tone, and unmistakably revitalized and moisturized. The Alpha Hydroxy Acids gently exfoliate dead skin cells, but what's remarkable is that there is no tingling, burning, or any sensation whatsoever for that matter, while the AHAs are hard at work. I have finicky skin that can be sensitive, and there is absolutely no downside to using this exceptional mask. I use this mask 3 times a week, and will continue to do so because the results are so tangible. The secret to the efficacy of this formula rests on StriVectin's patented NIA-114 technology that "strengthens the skin barrier as it hydrates and boosts the efficacy of the Alpha Hydroxy Acids (AHAs) to visibly renew and revitalize skin." It boasts an "effective dual-action complex of skin brighteners AHAs works synergistically to help even skin tone." Directions: Apply a thin layer over clean, dry skin, avoiding the eye area. Leave on for 15 minutes or until dry. Rinse off thoroughly with warm water. Use 2-3 times per week or any time for an instant boost of radiance. Ingredients: Aqua (Water, Eau), Bentonite, Glycerin, Butylene Glycol, Hydrogenated Didecene, Isopropyl Myristate, Cetearyl Alcohol, Hordeum Distichon (Barley) Extract, Vaccinium Myrtillus Fruit Extract, Myristyl Nicotinate, Polyglyceryl-2 Stearate, Helianthus Annuus (Sunflower) Seed Oil, Mica, Bellis Perennis (Daisy) Flower Extract, Saccharum Officinarum (Sugar Cane) Extract, Phellodendron Amurense Bark Extract, Santalum Album (Sandalwood) Extract, Potassium Cetyl Phosphate, Hydrogenated Palm Glycerides, Citrus Aurantium Dulcis (Orange) Fruit Extract, Citrus Limon (Lemon) Fruit Extract, Acer Saccharum (Sugar Maple) Extract, Tetrahexyldecyl Ascorbate, Tocopheryl Acetate, Soy Amino Acids, Nasturtium Officinale Extract, Melissa Officinalis Leaf Extract, Caprylyl Glycol, Ethylhexylglycerin, Hexylene Glycol, Disteardimonium Hectorite, Tetrasodium Glutamate Diacetate, Yeast Extract, Propylene Carbonate, Triethoxycaprylylsilane, Lecithin, Parfum (Fragrance), Phenethyl Alcohol, Sodium Hydroxide, Potassium Sorbate, Sodium Benzoate, Disodium Phosphate, Tetrasodium Edta, Alcohol, Phenoxyethanol, Chlorphenesin, Ci 77891 (Titanium Dioxide). 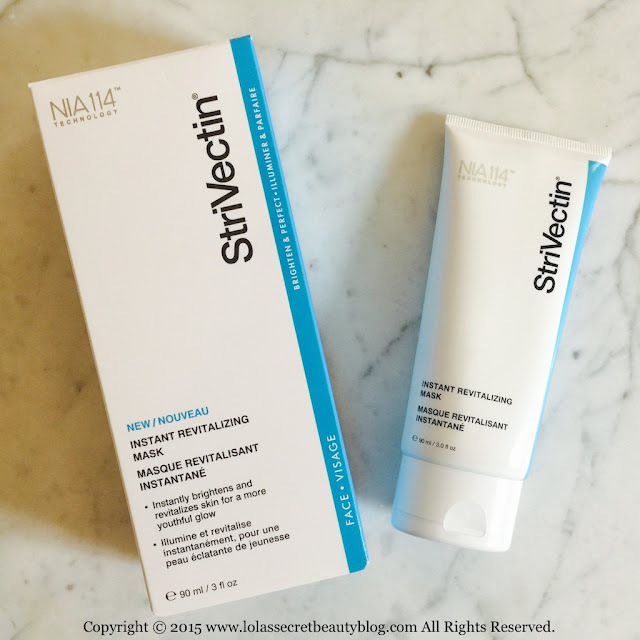 StriVectin Instant Revitalizing Mask and StriVectin Advanced Retinol Pore Refiner (Review forthcoming). Overall Assessment: Simply extraordinary. I am a true believer in the wonders of StriVectin. Their Instant Revitalizing mask is an extraordinary achievement as is their Advanced Retinol Pore Refiner that I have almost finished testing. If StriVectin isn't on your radar yet, then you owe it to yourself to take a look at their offerings. If you seek a non-drying mask that exfoliates dead skin, and reveals a youthful radiance– then this mask is definitely worth trying! $62.00 for 3 oz. from StriVectin, Nordstrom, Ulta, Bloomingdale's, Macy's, SkinCareRx, Birchbox, SkinStore, Beauty.com, Drugstore.com, Dermstore.com, QVC and Amazon (Affiliate Links). How is everything going? Here things are pretty busy. Once again going to the job market, teaching something I love (fortunately), working on a translation (more difficult than I expected), and the dreaded revised first manuscript (a mess. I don't know what I'm doing), an an edited volume (slow) so, uffff, not enough time for beauty. How are you? Is everything fine in your luxurious world of beauty, books, and acts? Hello, my beloved friend! I'm so glad that you are teaching something you love! Between teaching and doing your work, the added stress of the job market sounds like a whole lot of added stress. I'm sure that your manuscript isn't the mess that you perceive! I'm good, but feel a touch tired. I'm on a few grad committees– so I am working closely with these students on independent studies to prep them for their theses. I need to work on my manuscript, but am not in the mood. I have a very sick cat, and taking care of him is taking a lot of time, and is causing lots of worry since the vet can't yet tell if he's going to pull through. :-( Have you adopted your kitties yet? OMG, my friend, sending you and your cat love and light to pull through this. Gohs, my heart aches thinking about losing the ones you adore. No kitties here. We decided to wait until we move, again, ayyyyy. I'm not sure where I'll end up after this job market, you know? I don't want to mess with a cat's compass. Besides, we have had any imaginable problem with our building manager who happens to be the worst living being I have encountered in a loooooooong time so he makes our lives very difficult and I don't want to give that energy to any felines. They are so sensitive to emotions, really. Sending you hugs and strength to deal with your grads since they tend to be a lot needier than undergrads. All the best of the world for you and your furry and furries. Thank you, I appreciate it very very much! My fingers and toes are crossed that he will pull through! I'm so sorry to hear that your building manager is such a horrible person! That is so stressful to have to deal with that type of stress and disruption. I don't blame you for wanting to get kitties when you know where you will be living. I'm sure, however, that the love that you would give to any kitties( lucky enough two have you two as their human family members) would more than compensate for the bad energy that your awful building manager oozes! You are right though that felines can be very sensitive creatures. Yes, grads definitely tend to be far more engaged than undergrads, and they (generally) really want to be in grad school, and have made sacrifices to get there, and therefore definitely want a lot more out of us than do most of the undergrads. Keep me posted on your TT search, and I will do the same! This looks like something I would like! I LOVE face masks and this one sounds good! I love face masks too, and this one has really impressed me! I definitely think that it is well worth trying! As you said, this is a clay mask that even us dry-skinned girls can use. I like it a lot! It's really amazing that it isn't in the least bit drying. I am really so impressed, and it's all the more impressive that it works so well for your dry skin. It's less surprising on my combination skin, but it really is a testament to its efficacy that it works so well for the both of us! 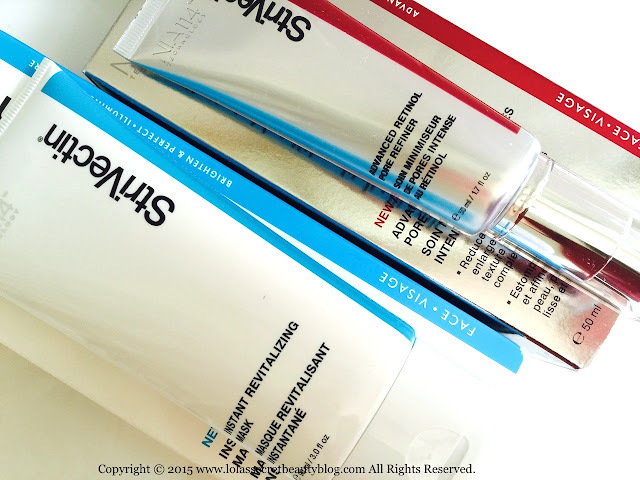 I love this masks, and I need to get my review up soon! It's great to see so many good reviews about it! I can't wait to read your review! I am so glad that you have and love this mask– it really is incredible! They really do make incredible products, Brooke! I'm so interested in this. 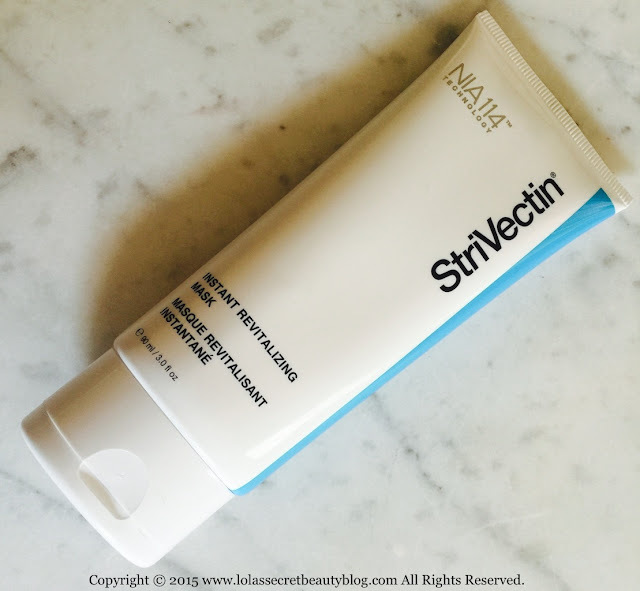 I am using my first StriVectin product and now I want more, more, more! I love masks so this should be next. I think that you would really love this mask so much, Marcia! I'm so glad that you are trying their products as well! I still have yet to try anything from Strivectin. I feel like I fail at life. This clay mask sounds great! I don't even have dry skin and sometimes clay masks are too much for me. It really is, Kristin! It is so unlike any other clay-based mask that I have tried, and I absolutely love it! I like this mask too twinsy. The immediate results are outstanding to say the least! I knew you would! You are so right about the immediacy of the results! The good reviews are well deserved! You had my attention from the start (I love masks) but this sounds particularly great! I love masks too, Bailey! This one is really special! I love trying all kinds of masques, I have tried some of Strivectens products , only trial sizes because they as you well know are very pricey. I did love everything that i fi try and some day would really love to try this masque as well as the retinol one too. Did you and Monica connect about the Estee Lauder GWP?